After fleeing their homeland, Australian refugee policies threaten to tear this young couple apart. An unforgettable story of love, hope and a quest for freedom. At seventeen, all Mojgan Shamsalipoor wanted was to be safe from physical and sexual abuse, go to school, and to eventually marry for love. In Iran, she was denied all of this. Milad Jafari was a shy teenage boy who found his voice as a musician. But the rap music he loved was illegal in his country. All Milad's father, a key maker, builder and shopkeeper, wanted was for his family to live free from the fear of arrest, imprisonment or execution. To do that they all had to flee Iran. Mojgan and Milad met in Australia. But in the months between their separate sea voyages, the Australian government changed the way asylum seekers were treated. Though Milad is recognised as a refugee and will soon become a proud Australian citizen, Mojgan has been told she cannot stay here even though the threat of imprisonment and further abuse, or worse, means she can't return to Iran. 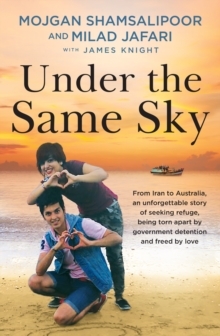 UNDER THE SAME SKY, is a powerful insight into the human face of asylum seekers and the the way history has shaped the lives of these two young people. It also shows the compassion alive in our suburbs. For Mojgan and Milad, their love keeps their hopes alive.